A serious and youthful Jack Teagarden posing for the photographer in the late 1920s, a time when all jazz players naturally dressed in formal attire. From "Jazz: A Photo History"
A few months ago my son, who has just graduated from college and is camping out at home trying to decide what next to do with his life, suggested we take a day trip over to New Paltz, NY. He'd been there several times before and he said the town had a couple of really good used record stores. "Record stores?" said I, doubtful. "Yeah," said he. "Just like the ones you're always telling me about." 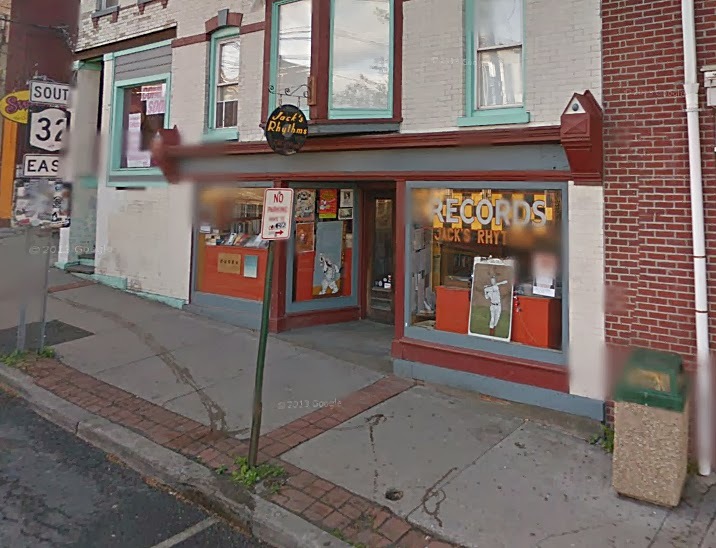 This I had to see, so off we went one Saturday to check out the vinyl in this college town near the Shawangunk Mountains. funky Google Street View image. New Paltz is only an hour away from where I live in the Catskills, so we left in the late morning and had lunch at a Thai restaurant on Main Street. Then we strolled over to Jack's Rhythms at 54 Main Street. 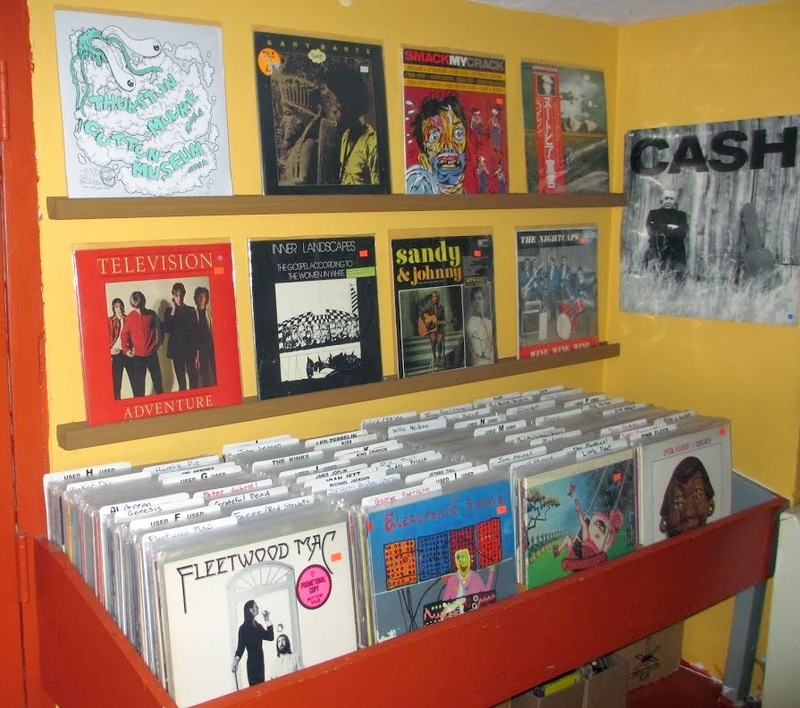 We walked in and there we were in a record store just like the ones I remember: bins of LPs arranged alphabetically by genre, music posters on the walls and a bespectacled geek behind the counter playing some esoteric rarity over the house stereo system. Most of the records were covered by polyethylene sleeves (these were used records, remember) and most were priced between $8 and $12. There were jazz LPs as well as rock, folk, blues and world recordings. Jack's also had CDs and a healthy selection of music books, but I went to work pawing through the jazz record bins. Bins! Just like in the old days. There were the usual Blue Notes, Impulses and Riversides at reasonable collector prices, but I already have most of those. I was looking for the mistakes that even knowledgeable record dealers make – the Ira Sullivan album filed in the bargain bin, the Claude Thornhill LP stuck in the cheapo Easy Listening section, things like that. Jack's appeared to be more aware than most of the record stores from my past (thanks no doubt to the Internet), but eventually I came across a few boxes in the back that were mark "$1 each." Pay dirt! I looked through boxes and came up with a number of interesting sides, most in acceptable shape. One I was very pleased to find, even for a collector's price. It was a Jack Teagarden from his early days as a leader on an obscure label – and a 10-incher. The label was Jolly Roger, one of the very first jazz bootleg outfits. Started by jazz fan Dante Bollettino in 1950, Jolly Roger featured reissues of unavailable classic jazz and blues sides in the then-modern 10-inch microgroove format. 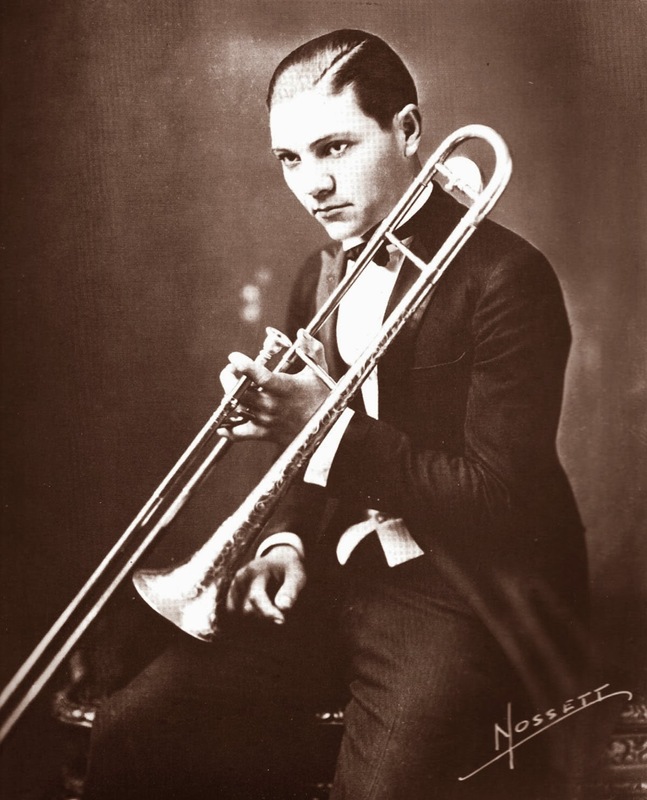 Artists like Benny Goodman, Bessie Smith, Jelly Roll Morton and Sidney Bechet had their music "pirated" by Jolly Roger (get it?). Bollettino even contracted with RCA Victor's pressing plant to produce his sides. It wasn't until Louis Armstrong and Columbia successfully sued Jolly Roger that production ceased and the company was put out of business. But hundreds of sides had been sold and a precedent had been set. Boris Rose would carry on the tradition of pirating in grand style a decade later (see our previous post) . of the label's covers, did the Goodman and the Armstrong/Bechet jackets here. 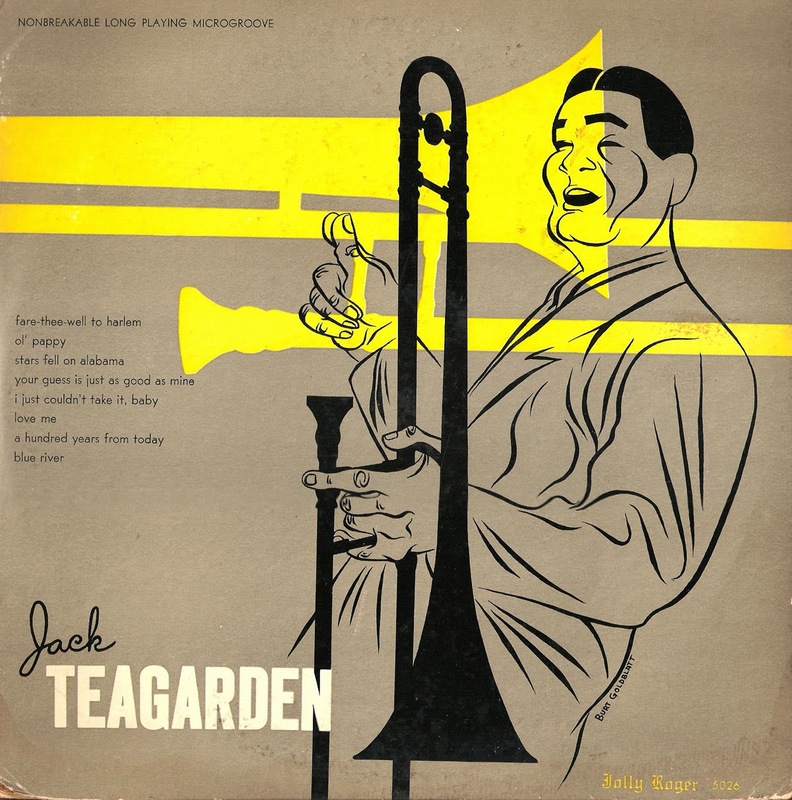 He also did the cover for the Teagarden LP that is this posting's download. So here we have a Jack Teagarden on Jolly Roger. The recording showcases early Brunswick sides that Tea did with a variety of large groups that feature some notable sidemen – Benny Goodman and Jimmy Dorsey the most prominent among them. 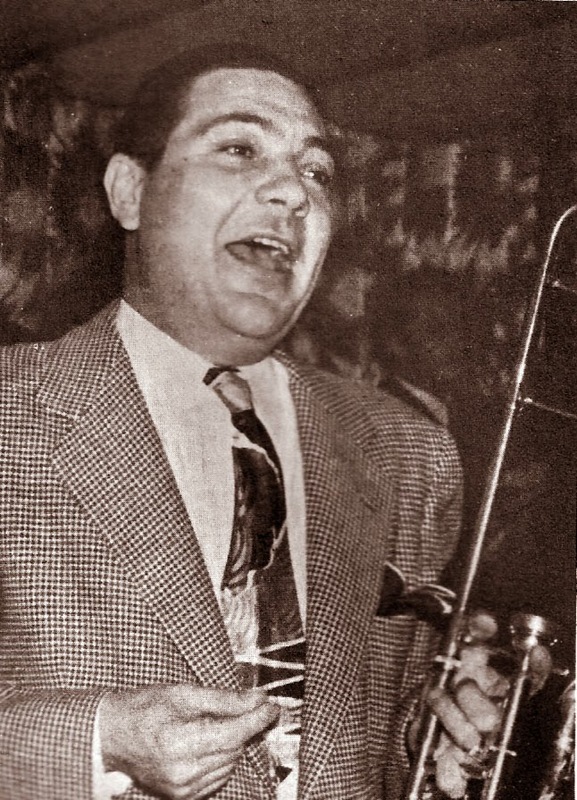 Jack was working with Paul Whiteman's orchestra at the time, but he had made a name for himself as a vocalist as well as a fine trombone soloist with Ben Pollack's band and he was occasionally contracted to do pop tunes for labels Columbia and Brunswick. These numbers all include Jack's distinctive laid-back vocalizing, undistinguished arrangements and some very fine (if brief) solos. The performances are, without exception, all excellent examples of the trombonist's approach to jazz. I'm not sure they're currently available, but in the early '50s they were certainly rarities. So our sojourn to New Paltz was indeed a productive one. As one of the earliest examples of a fan making music available to the greater public after it had been abandoned by its parent company, this LP is a marvelous historical artifact. It's fitting that it should be offered here on Gems because – whaddya know? – we're doing much the same thing. And for a buck, I couldn't pass it up. Jack Teagarden, tbn, v on all selections. Orchestra with Jimmy Dorsey, cl; Joe Venuti, vi; Nappy Lamare, v; others.